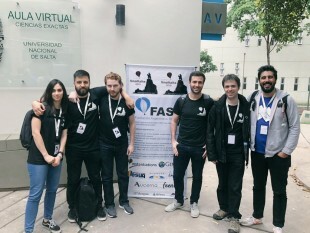 This year the Smalltalk conference in Argentina, Smalltalks 2018, organized by FAST (Fundacion Argentina de Smalltalk), took place at the National University of Salta. More than 200 students, academics and professionals of international reputation attended the meeting. The Mercap team was there as always, not only as a sponsor of the event but also giving various talks. Maximiliano Tabacman, one of the company's senior developers and member of FAST, gave a speech at the opening of the conference, as well as a presentation on Willow, one of our recent developments that consists of an interactive web library. He also gave another talk where he made known BA-ST (Buenos Aires Smalltalk): a local group of smalltalkers who meet periodically to exchange ideas and projects. Álvaro Piorno, also part of our team of developers, presented the new advances of Winter: a framework for programming games. We thank FAST for convening us as every year for this conference, which represents an excellent training opportunity for our entire team.